Goodreads Summary: Kami Glass loves someone she’s never met . . . a boy she’s talked to in her head ever since she was born. 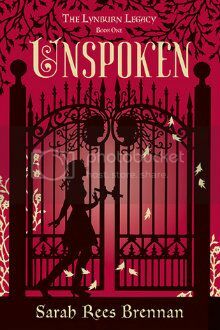 She wasn’t silent about her imaginary friend during her childhood, and is thus a bit of an outsider in her sleepy English town of Sorry-in-the-Vale. Still, Kami hasn’t suffered too much from not fitting in. She has a best friend, runs the school newspaper, and is only occasionally caught talking to herself. Her life is in order, just the way she likes it, despite the voice in her head. Mystery, intrigue, and love, all in an English setting? Yes please! Oh this one sounds good, going to have to be added on my TBR list. I agree this sounds worth waiting on! This book sounds really good. I cannot wait to hear what you have to say about it when you get the chance to read it. I have a copy of this - it sounds great, and has gotten amazing reviews from friends of mine. Can't wait to start it! Great minds think alike! Love your blog. Looks good, huh?! I have this waiting for me on Netgalley, and I'm really excited about it! Plus the cover is darling.